I can't stop playing, or thinking about, Ace of Seafood. I picked it up on my Nintendo Switch for free, thanks to the new "exchange gold points you earn from making game purchases for free games" system that Nintendo has implemented. I had a lot of points accumulated. Now, by any measure that you might want to apply to it, it's not a good game. Writing for DDNet, Moshe outlined some of the many issues with the game beautifully in his review, when it launched on the PS4 last year. I totally accept and agree with every one of those criticisms in Moshe's review. But on the other hand, I really can't stop playing the game. Or thinking about it. I'm "addicted" to it. For me, it's the perfect example of how a game can be so bad, and yet so, so good. And, importantly, it highlights a difference in how we look at and talk about games compared to some other art forms. What I love about Ace of Seafood is that it is so different. It's wild. It's wacky. The developers clearly understood that they were not making a masterpiece, and rather than try and hide that, they've gone the other way, and every moment of that game is a wink at the audience that shows that the developers know that they've created something intrinsically bad, but that they've been happy to embrace that. For someone like me, who through the great fortune of running a major games website does get to play a lot of games, different is something precious. As much as I love my JRPGs, rhythm games, Warriors titles and occasional open world romp, I generally find myself getting far more excited for the occasional game that comes my way that can make my eyes boggle a bit. 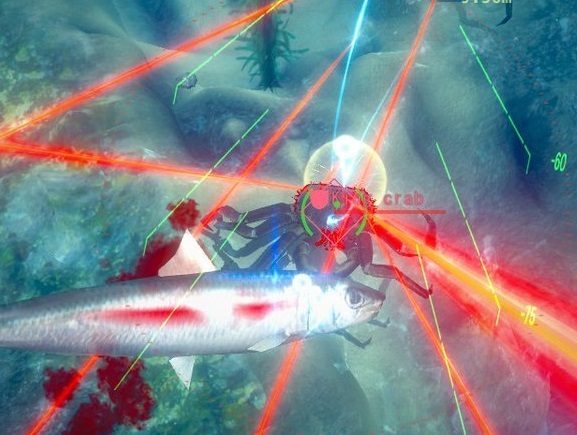 And a game about hordes of laser-shooting fish, crabs and sharks fighting over territory under the sea has certainly done that. Ace of Seafood is not the only game like that. Whether it's something explicitly B-grade and trashy, like Earth Defence Force or Onechanbara, right through to games that look like they belong more in a gallery than on the PSN, such as Far From Noise or North, I see parallels between these games and the B-grade, arthouse, and foreign film industry. Back when I harboured dreams of becoming a film writer, and took film courses at university to develop my knowledge of film, I spent a lot of time watching movies, niche and mainstream, foreign and old, right through to the biggest blockbusters. It was mandatory that we watched as many films as possible, and consumed as much of the film industry as we could - we read interviews, books, essays and analysis of just about every film we could get our hands on. There, too, I found myself developing a growing affection for the films that were different. It never really mattered how they were different. What was important was that they deliberately broke with the broad strokes that governed how most films were made. For every mass produced blockbuster by Spielberg or Scorsese that I poured over to understand the impeccable technique that went into them, I would joyfully go and watch a raw, confusing mess by Cronenberg for fun. If you haven't seen it yet, go and watch Naked Lunch. An absolutely glorious mess. I found myself getting a kick out of B-grade horror and exploitation cinema, in which the good examples (not the ones that Uwe Boll made) were inevitably self aware and delivered with tongue firmly in cheek. I fell in love with The Crow films (yes, all of them), because for all their rough edges and generally terrible acting, rarely would mainstream Hollywood find a gothic action film a marketable idea. I also discovered Japanese horror films at about this point, and whoo boy were those usually a wild ride. It wasn't always about having fun, either. Ken Park was banned in Australia while I was at university because its content was... well, it was offensive. I went along and watched an illegal screening of it, because that's what uni students do, and it was a bad, bad film. But indeed very transgressive. Another film, Irreversible, was extreme enough in its content that it made me feel physically sick (and, separately to the infamous scene I'm referencing there, there was also one scene in there that brought me frighteningly close to an epileptic fit), but it certainly had an impact on me and drove its themes home to the point that I've never forgotten that film. Now that I'm busier and don't have the time to consume dozens of films each week, I find myself watching the more extreme examples less frequently than I would like, but I still make the time when it's something by Shion Sono or another transgressive artist I'm really familiar with. I had developed such an affinity for these films for the same reason that I have an affinity for the videogame counterparts; I can appreciate the well made stuff, but that stuff also feels so creatively stifled. Budgets are big, so audiences need to be large and broad. Actors need to perform to type. Genres are safe and set in stone. And no one, anywhere, wants to risk offending anyone. If you only watch a few dozen films in a year, that kind of thing is either not noticeable, or not likely to be a problem. But try watching hundreds of films and not develop a craving for something genuinely different. These "B-grade" films, these "bad" films that can't match the production standards of their A-lister counterparts, are freer. They take more risks. They're willing to shock or be trashy, and they're happy to own that. They're happy to offend, or to be so experimental and different that you can't help but think they belong in an art gallery. The thing is, and I am speaking very anecdotally here, but there's a degree of acceptance within the film industry for these B-grade films, and it's something that the games industry hasn't quite achieved yet. It's getting better, but there's still this idea that "playability" - an approximate equivalent to Hollywood's production values and "watchability" - is the dominant requirement before you can start praising a game. In cinema. no one expects a trashy exploitation film to look like it has the budget of The Avengers, but a game like School Girl/ Zombie Hunter was panned as much if not more for not playing like a "good" shooter as anything else. Twin Peaks might not be a film, but despite being a production with far lower production values than a clean, easy watching TV serial, it has become a revered part of the "television as art" canon. Meanwhile, Deadly Premonition covers so much similar ground and was pounded into the dirt by half the gaming community for having superfluous "issues" to the main point; stuff like wobbly car driving mechanics. There's too much of a focus on how a game plays in this industry, that seems to override everything else. It doesn't matter if a developer wants to make something satirical or trashy, or if storytelling and thematic depth are what the developer focused on, if it isn't as slick as a mass produced blockbuster, it is therefore a bad game. It's fine for something to aspire to be a clean blockbuster, and for people to criticise it on those standards if the attempt doesn't meet the expectations of a blockbuster. That happens in cinema, too. DC films deserve (and get) criticism for being blockbusters and yet often failing to meet the technical proficiency of their Marvel Studios rivals. But when we start to get to the indie spaces, and when we're playing the weird, the outrageous, the experimental and the downright subversive, I feel we need to shift the tone of the discussion. Can you finish the game? As long as the answer there is "yes," then I honestly don't think fixating any further on the gameplay is of any benefit. As a result of not focusing on gameplay, the game might only reach a certain niche, just as experimental art films can never expect the audience of a Marvel production. But is that really a flaw?